You’ve decided you want a natural birth. And you know a midwife is the best person to support that decision during your pregnancy, labor, and birth. But how do you go about finding a midwife? And once you do, how do you know she’s the midwife for you? Certified Nurse Midwives (CNM) are the most widely recognized group of professional midwives. They are registered nurses who have gone on for additional training as midwives. After attending an educational program accredited by the American College of Nurse Midwives Certification Council they must pass their examination and then are licensed. CNMs generally work under the supervision of a doctor (but in Iowa they can be independent!) Most carry malpractice insurance and participate in hospital births only. However, there are some CNMs that do attend homebirths and often they accept insurance reimbursement. Direct Entry Midwives (also called traditional, lay, independent, or Certified Professional Midwives) are not required to become nurses before training to be midwives. They arrive at their practice through a variety of routes including personal study and experience, formal training programs, and/ or private apprenticeship. Direct entry midwifery is not recognized in Iowa or Illinois, so these midwives might be more difficult to find and do not accept insurance. (My readers in Minnesota and Wisconsin are far luckier!) However they are homebirth specialists! A Certified Professional Midwife (CPM) is a type of direct entry midwife who has had her skills and experience evaluated by the North American Registry of Midwives and passed a written examination. The first step is finding midwives to interview. Ask friends who loved their birth experience. Go to the local La Leche League or Crunchy Mama facebook page and ask around. Also, check out midwifery websites like the ACNM, MANA, NARM, and Midwifery Today. It is important to interview two or three midwives before you make a decision. It will help if you have an idea of the kind of birth you would like. Do you want to deliver at home? Hospital? Birth Center?Do you want a midwife who will massage and encourage you during labor or do you want someone who will basically sit in the corner and knit, intervening only if there is a problem? Do you want FHTs to be monitored with a fetoscope intermittently or hooked up to an electronic fetal monitor? Do you want to deliver in water? Although midwives are alike in many ways, in many more ways they are very different. Here is a list of questions you can ask when interviewing your midwife. Don’t be shy, midwives like to know their clients are a good match! -Why did you become a midwife? -What kind of training have you had? -Do you practice at homebirths? Birth Centers? Hospitals? -Are you certified or licensed? -Do you belong to professional organizations, attend conferences and workshops, subscribe to professional journals? -What basic philosophies guide your practice? -How many births do you attend a month? -What tests do you require prenatally? -How far past my due date will you allow me to go? -Do you deliver VBAC, breeches, or twins? -What emergency equipment will be available at the birth? What isn’t available? -What kind of emergency situations have you handled? -Have you ever given birth? -Who will attend my birth with you? -How will you monitor my progress? -How will you monitor my baby’s health? -May I eat and drink during labor? -May my other children be present? -Do you use herbal or homeopathic remedies? -May I deliver in a birth pool? -May I or my partner catch my baby? Assuming all is well? -If we transport to the hospital will you stay with me? -What is you transfer rate? -What is your induction rate? -What is your cesarean section rate? -What is your episiotomy rate? -What is your fee and what does it include? -What kind of commitments are we responsible for; childbirth classes, back up doctor, lab work, hospital registration, birth certificates, new born testing, supplies…..? 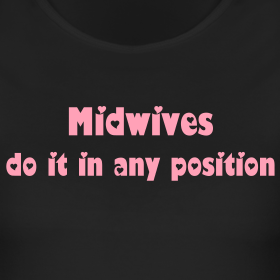 -What do you consider your responsibilities as our midwife? These are initial questions to be asked at your first meeting. There are hundreds of other questions that you will ask through out your pregnancy. It should be very important to your prospective midwife that you know the complete answer to each question. Try to schedule a special interview visit, so you aren’t sitting on an exam table wearing a sheet. It is important to remember that midwives are providing a service to you. As a consumer, you should be fully informed of your options. This will not only help ensure that you feel empowered by your birth experience, but will also change birth, for all women and babies, for the better.